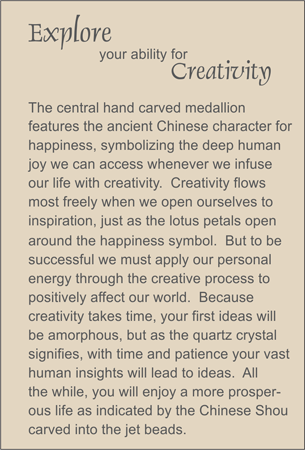 MEDALLION: Poppy-colored serpentine hand-carved medallion representing the open petals of a lotus flower surrounding a central happiness symbol. ACCENTS: Jet beads carved with the ancient Chinese Shou for long life, and small quartz crystal ellipses. COMMENTS: Great gift for letting a man know that he is creative.